• Pattern design for deluxe and comfortable sports cars.Bi-bias arc-shaped pattern makes for low rolling resistance and strong shock absorption. • Superb performance on wet road.Six continuous straight grooves make for highly efficient water dispersal and minimize the possibility of skidding on wet and slippery road. 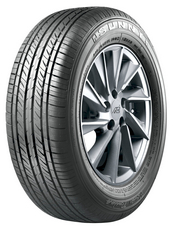 • Outstanding performance also benefits from wide and flat tread. • Extremely low road noise gives you a comfortable riding on road surface. • Luxurious design shows superiority of quality to the best. • Wide center block improves steering response. • Unidirectional lateral grooves deliver excellent drainage to improve hydroplaning. • Four wide circumferential straight grooves for improved hydroplaning. • Optimized unidirectional tread pattern offer top sport feeling. • Slip resistant tire pattern designed with unidirectional”人” type enables high speed,prompt water evacuation and ensures safety in the event of slip. • Endurable,stable and comfortable and lownoise,high speed up to 300km/h. • Unique design of biological modeling pattern,streamlined and stylish.